Most of you are familiar with the Rewards Canada Travel Rewards Credit Card comparison charts (there are five six of them). These charts are a staple on Rewards Canada, in fact they are some of the most visited pages of all the pages on my site. That being said, I haven't added a new chart in nearly two years and only updated individual cards on those charts. 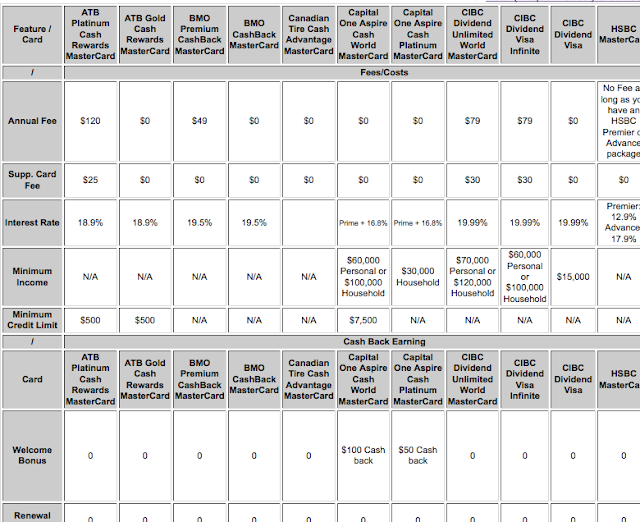 Fast forward to today and I felt it was time to add cash back credit cards to Rewards Canada and the first logical step was making our standard comparison chart for these cards. Cash Back cards are gaining huge traction with Canadian consumers due to the relative ease of understanding the reward, low costs (most cash back cards have no-fees) and of course being able to use the cash back reward for anything. 1. Although my specialty is Travel Rewards, most loyalty programs run on the same basic premise with many of the same strategies so the knowledge I have garnered can be extended to other programs. Plus, the word travel is not included in Rewards Canada, so technically speaking I can cover all rewards, right? 2. Since you get cash back on cash back cards you can use that cash to pay for travel! Which means cash back cards could be considered pseudo-travel rewards cards. 3. Cash back cards make great sense for you secondary or tertiary cards. You've heard me say over and over again that you should carry a Visa, a MasterCard and an American Express card to cover promotions or non-acceptance of specific cards. If travel is your main goal, make your primary credit card a travel card and keep yourself open to travel or cash back cards for the other two credit card brands. Since those second and third cards won't be used as much, the ability to earn travel rewards may never happen or take a long time to achieve, so a cash back card can fit in nicely to reward you on a yearly basis. I think that is enough explanation of my choice to cover Canadian cash back credit cards so be sure to check out the Cash Back Credit Card comparison chart today! I hope you find it informative and helpful. I would love to hear what you think of it by leaving your comments and questions below. If you see anything that needs correcting on the chart feel free to comment below as well. Excellent summary! Isn't the Amazon-branded Visa card from Chase a cash-back card? It earns 1 point/$ on non-Amazon spending and converts 2,000 points to a $20 statement credit automatically. The big benefit is, of course, that they don't charge the 2.5% FX fee. Have you considered adding the FX fee % to your charts? Thanks for reminding me about the Chase Amazon Visa, I forgot about that one after mentioning it awhile ago about FX fees. I will add it to the chart shortly. I have been meaning to add FX rates to the charts but keep procrastinating about it as I work on other things! I will make sure to get to it soon as well! I'm glad to see that I made a good decision in using the MBNA Smart Cash Platinum Plus MasterCard to get no-tiered, 3% cash back on gas and groceries after the first six months, without an annual fee.